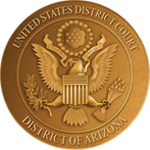 The mission of the U.S. Courts for the District of Arizona is to deliver the highest measure of justice by providing an accessible, impartial forum for the resolution of disputes with the consistent, just, efficient, and timely delivery of service to the bench, bar, public, and other entities with whom the courts interact. The court will do so in the spirit of cooperation among all parts of the greater court family to insure public trust and confidence and preserving the judicial independence of the court as an institution, and with honor, dignity and respect for all. The Clerk's Office accepts federal district court filings, provides general information relating to filing procedures, and maintains the official court record. The staff of the Clerk's Office ensures the effective, efficient and professional delivery of clerical and administrative services, while fostering a customer-friendly and employee-friendly environment. The U.S. Probation Office supervises offenders serving sentences in the community, including probation and supervised release imposed by the federal courts and parole granted by the U.S. Parole Commission or military authorities. Probation conducts investigations of convicted offenders and prepares presentence reports containing information relevant to sentencing, in accordance with the sentencing guidelines promulgated by the United States Sentencing Commission. U.S. Pretrial Services conducts bail investigations on defendants charged with federal offenses and for supervising defendants released by the court awaiting trial. Pretrial Services makes recommendations as to release or detention so that the court can make a more informed decision, and also investigates and supervises pretrial diversion cases. It shall be the mission of U.S. Pretrial Services for the District of Arizona to serve with the highest level of professionalism and provide services to the Court, the community and defendants by seeking alternatives to detention with fairness and impartiality.